Season the chicken breasts and roll them up tightly in microwave-grade cling film. The packets need to be tight and should not trap any air. 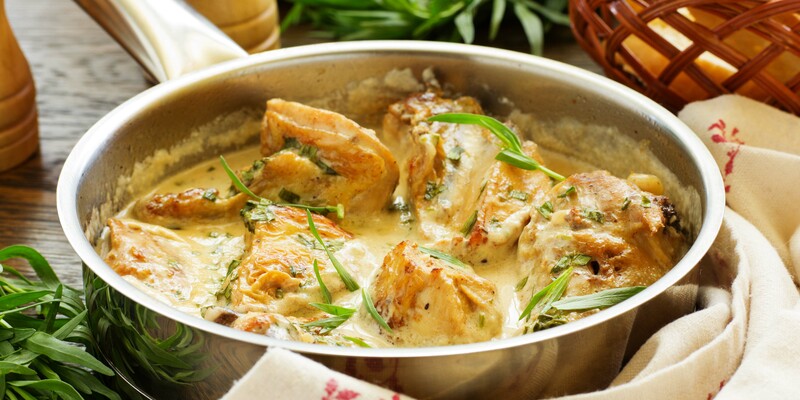 Put the chicken stock on to heat to a rolling boil; remove from the heat and drop in the four chicken breasts, making sure that they are tightly wrapped and sealed in, before leaving them to cook for an hour as the pan cools down off the stove. Meanwhile, peel the langoustines: set the tails aside in a cool place and roughly chop the heads. With a bit of olive oil in a saucepan, brown the chopped up langoustine heads before adding the vegetables and cook them a bit more until evenly browned. Sprinkle the hot pan with the Cognac and set light to it with a match; when the flames die down, add the white wine and reduce it completely before adding the crème fraîche, thyme and bay leaves. Bring the pan to the boil and let it cook gently for five minutes before taking it off the heat and covering it, before leaving it to infuse for an hour and a half. Filter it through a fine conical sieve, check the seasoning and keep in a warm place. Take a frying pan, unwrap and brown the chicken breasts, before adding the langoustine tails to cook briefly. Then slice the chicken into fine slices (tornedos) and cutting the langoustine tails into little rounds. Plate them up immediately and top with the organic crème fraîche, having first checked the seasoning, warmed it and emulsified it. You can serve this dish with Hamburg parsley roots or mashed Jerusalem artichoke or wild mushrooms.